5-second summary: We’re moving from Slack to Discord on Monday. We’ve also set up a discussion Forum. The attention and interest the Bitcoin Gold project has attracted is phenomenal and continues to expand. Part of our ambition for serving this growing community is to continuously improve communications… both by improving our messaging to the community and by enabling discussion within it. We want to preserve open and free speech, but we need to mitigate some of the ill-effects of trolls and discord. At the same time, we want to give people every opportunity to produce and publish thoughtful content and to engage in more elevated discourse. To help do both of these things, we’re planning to change some of the tools in our toolkit. Like many projects before us – including some software development and crypto communities – we’re discovering that Slack isn’t the best tool for communication with an active (and sometimes boisterous) user base. Slack is an excellent tool for teams to coordinate and share their work, but it’s not the best for facilitating public interaction. Many of our Community members have proposed moving to Discord, which is also the tool that Dash Nation and the Nebulous Siacoin chose when they moved away from Slack. After considering several alternatives, we agree. Discord was initially developed with gamers in mind, so it provides a better toolset for community moderation (which you wouldn’t expect a Slack team to need) and is better at preventing impersonation and spam (which you certainly shouldn’t expect from your own team, but must always expect from the internet!) Because these features are well-implemented and supported, it has been increasingly adopted project communities of all kinds. 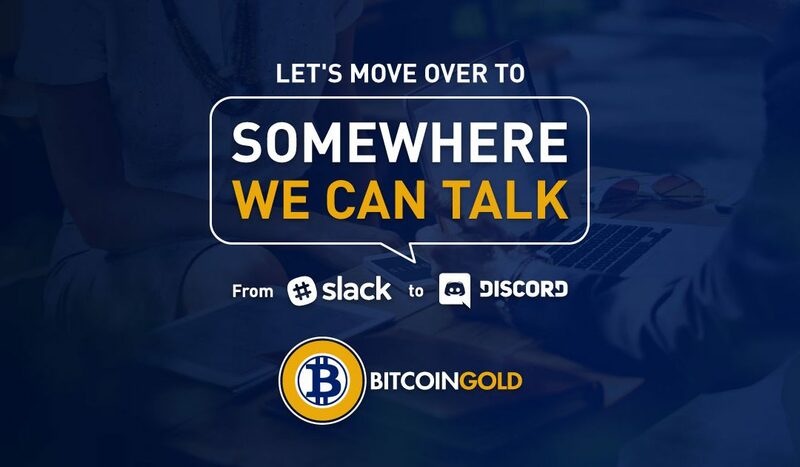 We configured a Discord server for the Bitcoin Gold community, and we’ll be moving activity from Slack to Discord over the coming days. If you love Slack or can’t use Discord, don’t worry, Slack isn’t going away! The Slack will still be open and we’ll be there to hear voices and give people answers, but it will no longer be the primary or quickest way to reach the support team. We’ll continue to inform the Slack channels when important announcements are made, but we’ll also be gradually reducing the number of Slack channels. Our Discord will officially be open for joining beginning January 8th, 2018, and we expect to make it the primary tool for real-time discussions and support beginning January 15th, 2018. Slack will stay open, but channels will be gradually consolidated as volume decreases to simplify monitoring. Real-time discussion is great when it’s one-on-one, but when a crowd is involved, or developments are moving quickly, it can become hard to follow. Information can literally scroll up off the screen faster than people can read and respond, and we don’t want voices in the community to be lost. On top of that, reviewing a chat transcript to look for a particular topic of discussion is… well, it’s not ideal. But there’s a tried-and-true tool on the web which addresses these tensions: the Forum. A Forum provides a more stable medium, where people can compose their thoughts more carefully – and since the posts stay put, they’re easier to find later. It’s a better format for developing and posting reference material or in-depth writing, both for community members and staff alike. That’s why we’ve set up a forum for the Bitcoin Gold community, using the Discourse software package. We hope you agree with us that it’s an excellent, modern, open-source forum platform – it’s clear to us why places like Udacity, Patreon, and Docker have chosen to use it, either publicly or internally. We’ve started testing it out privately and love it, but as any experienced internet citizen knows, a forum is only as good as the community using it. We’re opening it up to the public for early adopters and participants effective immediately, and expect it to become a primary community resource rapidly. Early adopters are welcome to explore the new platforms with us but should bear in mind that structure and format are liable to change as they evolve, especially in the beginning. The Forum is open to the public effective immediately. It’s still a bit bare but is picking up content. Feel free to offer insights or ask questions! As public input and participation grow, we expect it to evolve into a primary reference resource rapidly.